After installation Super Mario mod, you get 15 new block-elements in Minecraft Pocket Edition 0.14! With their help you will be able to create different structures and parkour levels. Created levels will be almost the same as in the game Super Mario! 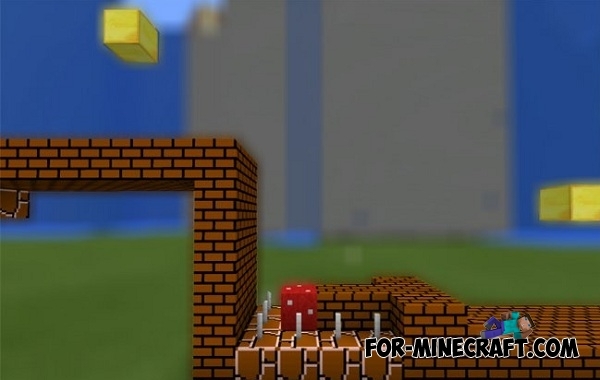 The mod is based on the Super Mario game, and now you have the ability to create a Mario map in Minecraft PE! Super Mario mod creates unique function for standard blocks with which you are already familiar, if long enough to play in the MCPE. Nine blocks are simply decorative. These blocks are designed for decorating your parkour levels. The other six blocks have interesting properties that are necessary to create parkour maps! Gold block - by touching the bottom of the blockthe player gets a coin. Jumping mushroom - block changes the jump height in 6 blocks! Spikes - take one heart and you will go to the last checkpoint. You are likely to be interesting to see how these blocks work on a ready map. Blocks available only in creative mode. How to get the blocks in survival? Download Simple Commands and type the command: / give . Example: / give 200 64 - we get 64 bricks. How to download this mode?